Recycled Thermoplastics Market size will surpass USD 95 billion by 2025; according to a new research report by Global Market Insights, Inc. Expansion in electrical & electronics industry in North America is one of the contributing factor that will positively influence the overall recycled thermoplastic market size in coming years. Recycled thermoplastics is used in electrical & electronics industry for cable & wire insulation, cable trunking, refrigerator trays/linings, tv cabinets, kettles, etc. Global production of the electrical & electronics industry was worth more than USD 4.5 trillion in the 2017 and the U.S. alone holds 10% of the global share making it the second largest producer in the world. Increasing household spending along with technological advancements in the telecommunication & IT sector will act as a contributing factor that will bolster the electrical & electronics industry growth specifically in North America region. The aforementioned trends are expected to continue driving the recycled thermoplastic market over the forecast period. Building & construction industry growth will act as a major fueling factor for recycled thermoplastic market in recent times. Recycled thermoplastics are widely used in sidings, panels, insulation, doors, plumbing fixtures, floorings, bathroom units, railings, gratings, structural decorative in the building & construction industry. In Asia Pacific, the construction industry output is expected to reach USD 4.8 trillion by 2021. This trend will follow due to stimulus initiatives taken by the governments of China and India and this will subsequently influence the recycled thermoplastic market growth positively in forecast spell. Based on type, the industry is categorized into non-bio degradable and biodegradable recycled thermoplastics. Non-biodegradable shows the substantial growth with CAGR more than 9% by 2024 on the basis of volume. This is all due to the low prices and ease of availability of the product in the market and will boost the entire recycled plastics market growth in coming years. Based on volume, granules will capture over 25% share of the entire segment in coming years. This is all due to its extensive usage to produce the packaging products for various end use industries such as food & beverage, etc. Based on technology, blow molding witnesses a substantial growth with CAGR of around 8.5% in the forecasted timeframe. The usage of blow molding technique for the production of bottles and containers and will subsequently spur the demand of technology in future. On the basis of revenue, polyvinyl chloride (PVC) witness the CAGR of more than 8% from 2018 to 2025. Product properties such as dimensional stability, resistance to weathering and electricity makes it suitable to produce extruded wire coatings, pipes, toys, bottles, fabric coatings, films, doors, windows components, etc. These products found their application in myriad end use industries thus increasing the sales of product in near future. Automotive & transportation shows a decent growth in the application segment with the CAGR of about 10% in the forecast spell. Increased affordability due to surge in income of population, easy availability of cheap skilled labors and technology modernization to improve fuel efficiency will boost the automotive & transportation industry and this in turn will escalate the product sales in future. On the basis of region, China recycled thermoplastic market will witness CAGR of more than 8% in coming years with revenue of more than USD 5 billion by 2025. Rise in population along with improvement in standard of living will significantly enhances the electrical & electronics, furniture & housewares industry in the country, thus influencing the demand of the product in positive manner in the region. 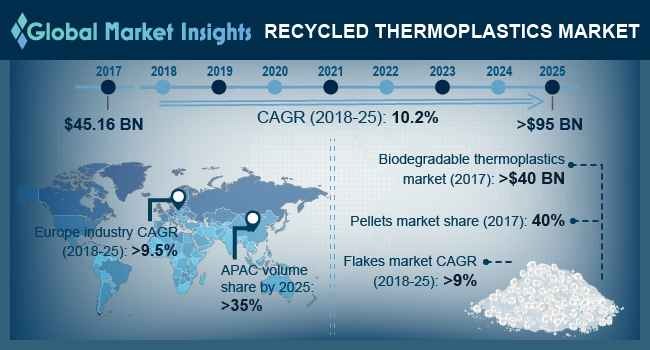 The key recycled thermoplastics market players include KW Plastics, PARC Corporation, B. Schoenberg and Co., Plastipak Holdings, Inc, Custom Polymers Inc., Suez SA, Merlin Plastics Alberta Inc., Revital Polymers, Ricova International Inc., RJM International Inc, JP Industrial, MRC and others.